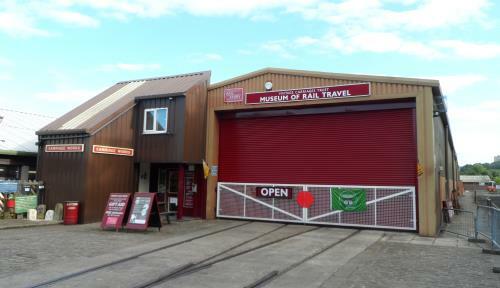 Museum of Rail Travel, Ingrow. There are two museums in Ingrow Station Yard We are located 200m from Ingrow Station at the end of the yard. The Museum of Rail Travel is open from 11.00 am every day except 25 December. Last admission is at 4.00pm. Groups are welcome by prior arrangement and we may be able to arrange evening openings. Entry to the Shop is free. We sell hot and cold drinks, ice cream and sweets as well as souvenirs, back-number magazines, pre-owned railway-interest books and assorted cast-iron plates, railway lamps and other 'Railwayana'. Rail Story Ticket to visit both museums at Ingrow. Entry to the Museum of Rail Travel and Ingrow Loco Museum is £5.00 for adults, £4.00 for concessions, and £3.00 for accompanied children. We regret that unaccompanied children are not admitted. If you only wish to visit one museum, charges are £3.00 for adults, £2.50 for concessions and £2.00 for accompanied children. We regret that unaccompanied children are not admitted. If you are travelling on the Keighley & Worth Valley Railway, ask for a Day Rover Ticket which includes admission to the Museum of Rail Travel, admission to Ingrow Loco Museum and a day's unlimited travel on the Keighley and Worth Valley Railway. Day Rover tickets are available at our Museum, also at any Worth Valley Railway Station (when staffed). Our vehicles are sometimes loaned to other railway preservation societies and film companies and not all our stock may therefore be present at the time of your visit. Details of VCT carriages and locomotives on loan elsewhere are usually on our news pages, but if intending to visit to view a particular vehicle it would be worth enquiring first. Occasionally, special events held by the Worth Valley Railway may involve the use of Ingrow yard and/or our vehicles. If your visit coincides with one of the Ingrow Yard special events, please inform the Worth Valley Railway attendant that you would like to visit our Museum. The Trust is very pleased to open its archives and allow access to the stored collection for research purposes. However, not all of the Collection is on display or on site and a volunteer from VCT would have to be present . It is therefore essential that any visits are pre booked and must be during the opening hours of 11am to 4pm. Please contact the Hon Curator, Jackie Cope, via the Trust’s email or postal address to make any arrangements. Travelling to Ingrow Click for a streetmap of the area. Ingrow Railway Centre is on the A629 road from Keighley to Halifax, about one mile from Keighley town centre. The entrance is between Ingrow Lane and Haincliffe Road. Look for the "Brown Signs", and for the large ornamental entrance gates. Car parking space is available in the yard and no charge is made. Satnavs should be set to postcode BD21 5AX. Travel to Keighley Railway Station. Keighley may be reached by frequent MetroTrain electric services operated by Northern Rail from Leeds, Bradford Forster Square and Skipton, with through services from Morecambe, Lancaster, Carnforth and Carlisle. East Coast Main Line Company operates a frequent service from London King's Cross to Leeds. There is one direct service from London to Keighley on Monday to Saturday evenings, with an early morning direct train from Keighley to London on Mondays to Saturdays..
On arrival at Keighley Station, if the Worth Valley Railway is running, walk over to Platform 4 and take the Worth Valley train to Ingrow (the first stop out of Keighley). For the current Worth Valley Railway timetable see the Keighley and Worth Valley Railway Web Site. Keighley Bus Station is about 10 minutes walk from Keighley Railway Station. Any bus from outside the railway station will take you to the bus station (just one bus stop away), and then take any of the buses listed below to Ingrow. Alternatively, take a taxi: there's a taxi office just to your right as you come out of Keighley Station. Ingrow Railway Centre is on the A629 road from Keighley to Halifax, about one mile from Keighley town centre. The entrance is between Ingrow Lane and Haincliffe Road. Services B1, B2, B3, 67 & 68 from Keighley Bus Station pass the gates of Ingrow Railway Centre. Alight at the bus stop after the petrol filling station. The bus stop is between Ingrow Lane (on your right) and Haincliffe Road (on your left). Keighley & District service B3 from Hebden Bridge. Keighley & District service 67 & 68 from Bradford via Thornton, Denholme and Cullingworth. Alight at Ingrow Church, which is adjacent to Ingrow Lane.